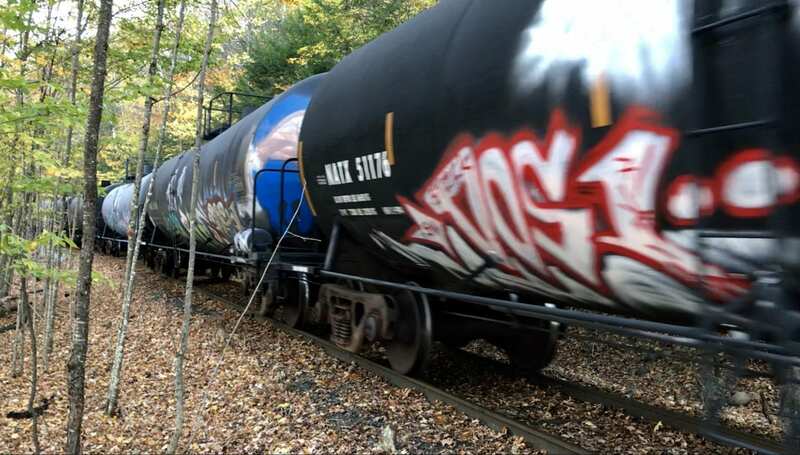 Protect the Adirondacks applauds the removal of 22 old hopper rail cars at the end of July that had been stored on the banks of the Hudson River for more than two years outside of North Creek beside NYS Route 28. The rail cars appeared to be in disrepair and blocked the view of the Hudson River for travelers on Route 28 and nearby landowners. The removal appears to be one of the last steps of Iowa Pacific Holdings withdrawal from the area as it has walked away from its lease with Warren County and the Town of Corinth for the Saratoga & North Creek Railway that runs between North Creek and Saratoga Springs. In the fall of 2017, Iowa Pacific Holdings started storing used oil tanker railcars on the Sanford Lake Rail Line, between North Creek and the Tahawus Mine in Newcomb. Through the fall, they stored more than 100 oil tankers and stated that they hoped to store 2,000 to 3,000. The State of New York, state agencies, local governments, and environmental organizations opposed storage of oil tankers over concerns that it would create a 30 mile long linear junkyard leading to environmental degradation of the public Forest Preserve, wild rivers, and private lands. The State of New York submitted a petition with the federal Surface Transportation Board (STB) arguing that the 30-mile Sanford Lake Railway should be decertified because the line was not being used to haul minerals from the Tahawus Mine. The Sanford Lake Railway was certified in 2010 by the STB for purposes of hauling freight from the mine. Protect the Adirondacks was the lone voice in opposition to certification at that time. “Many people have complained about the string of dilapidated railcars standing between the highway and the Hudson River for more than two years. 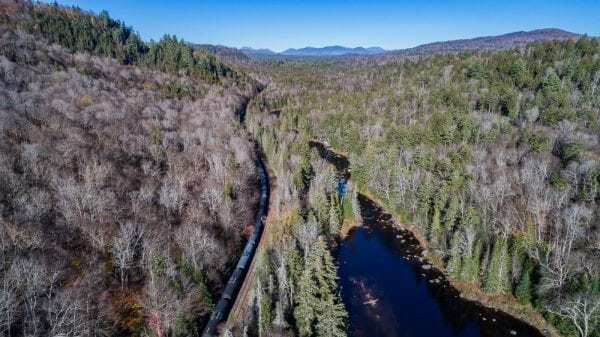 It’s good that these rail cars have been removed, but they never should have been allowed to be stored for years on the banks of the Hudson River,” said Peter Bauer, executive director of Protect the Adirondacks. The future of the Saratoga & North Creek Railway, which runs between North Creek and Saratoga Springs and is owned by Warren County and the Town of Corinth, remains in doubt. The future of the 30-mile Sanford Lake Railway, which runs from North Creek to the Tahawus Mine remains in doubt. Protect the Adirondacks has called for decertification of the Sanford Lake Railway and the conversion of the Saratoga & North Creek Railway to a public recreational trail. The state’s petition at the Surface Transportation Board is pending. The state cites opposition of local governments to support its petition. In the petition the state formally rescinded its support in 2010-2012 for reopening the Sanford Lake line since it argues that Iowa Pacific has failed to use the rail line for hauling minerals from the mine and allowing a seasonal snowmobile trail. The state ends the petition with a series of motions seeking to compel a favorable decision from the STB. Iowa Pacific has asked the state to buy out its interest in the Sanford Lake Railway, which the state to date has declined. The Warren County Board of Supervisors is in the process of ending its contract with Iowa Pacific Holdings, which has violated its lease with the county by not paying its monthly fees and not maintaining the tracks. On August 10th, the Department of Public Works Committee will meet to discuss the possibility of new uses and the possibility of leasing the line to other operators.